We slept poorly, waking up around 04:00, and then having trouble getting back to sleep. Eventually we got up around 07:00 and decided to have the hotel breakfast, since we didn’t want to get ready to go, take half an hour to walk to the town centre, and then discover no places open to get some breakfast from. Jason had told us last night that today was a public holiday (presumably for All Saints Day), and so we thought maybe a lot of cafes might be closed. We filled up on the breakfast, with muesli, fruit, yoghurt, bread, scrambled eggs, and croissants. There’s a Swiss thing called Ovomaltine, which comes in a few different forms. One is a chocolate spread like Nutella with crunchy bits in it. M. tried that one some croissant and liked it. After eating, we rugged up for the morning cold. I pulled out my beanie and gloves for the first time on the trip. 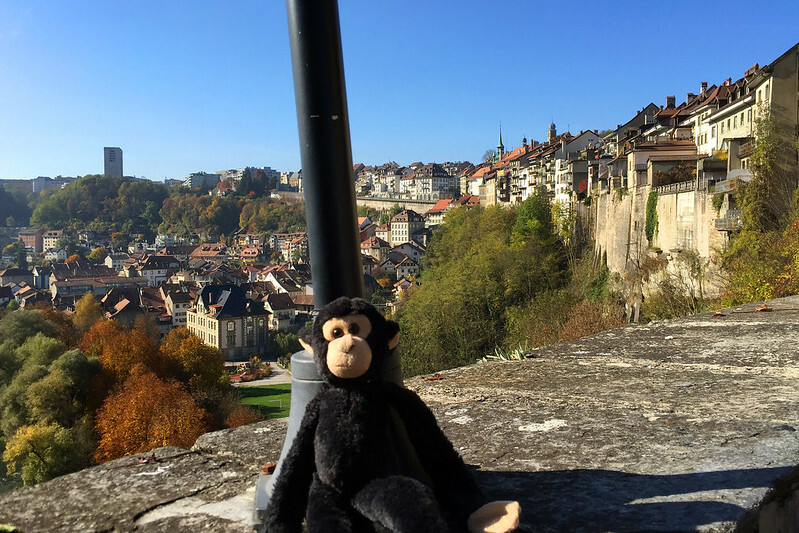 We walked south along the main road to the centre of Fribourg, about half an hour away. Part of the way in we passed a circus, apparently named Knie, set up with a big top tent and various outbuildings and sideshow attractions. Jason later told it that the circus was advertising everywhere but was only in Fribourg for a couple of days before moving on. Towards the centre of town, the industrial area we were staying in gave way to older buildings with steeply sloping roofs, stone walls, fountains, and other more interesting architecture. We passed through the old wall of the city, which had a section well preserved, with a guard tower. Inside we walked past an amazing old school building, with a stone lion and an eagle on the two front corners, several churches, and a museum of arts, and then the Gutenberg Museum. This led us to the impressive monolithic square tower of the Cathedral of Saint Nicholas. Unfortunately the front facade was partly covered in scaffolding for some restoration work. We were meeting Jason at 10:00, but we were ten minutes or so early, so we went inside the cathedral to get out of the cold. Priests were setting up and a few people were seated, with more arriving as we wandered around the interior. There was obviously a service going to begin at 10:00. The inside of the cathedral showed its age a bit, and was dark and gloomy, with heavy pillars supporting the upper structure. 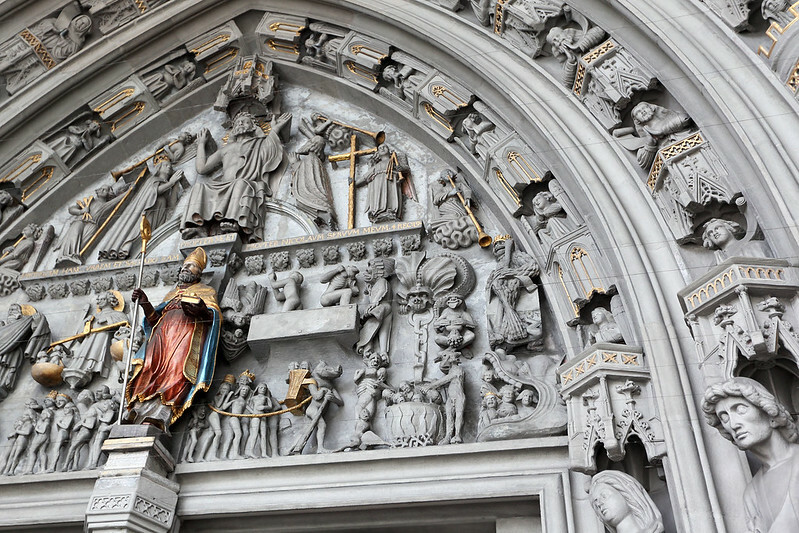 The most interesting decorations where actually outside, on the portico around the main doors, which was covered in stone sculptures of saints and a bizarre scene above the doors showing some sort of damnation events, with people being marched naked, boiled alive in a cauldron, and devoured by giant beasts. Jason arrived shortly after 10:00 and led us away directly opposite to the direction we’d come from. He took us to the Zähringen Bridge, a stone bridge crossing the river Sarine, high above the water level. 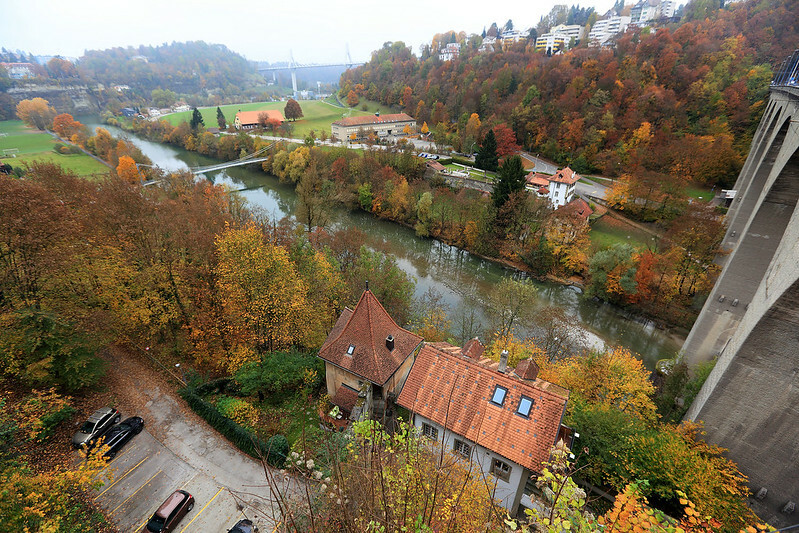 The river had gouged a deep and steep sided valley, and forest in spectacular autumn colour spilled down the slopes, mixed with old houses in the Swiss/Bavarian style. Jason told us the river marked the boundary between French-speaking Switzerland, on the side we were staying on, and German-speaking Switzerland, across the river. The old town of Fribourg was down in the valley, nestled on the banks of the river, while newer construction (which included the old cathedral!) was up on the plateau above the valley. We walked slowly across the bridge, admiring the view in all directions. Jason pointed out a small property down on a grassy area by the river, which had a lot of things looking like children’s playground equipment and giant colourful animals. He said it was a place owned by an old man, about eighty years old, with a shock of white hair, who was a sort of patron of the city. He had the keys to the city, and was the only person allowed to ride a moped without a helmet, and once a year he held a big event for the local children in his playground garden, setting up a giant treasure hunt for them. He also had an artist workshop down in the old town, which we walked by later – a large barn-like building with three floors. Across the bridge, we then needed to descend the slope of the river bank to the old town. The road traversed the slope and led us to a foot path which descended the hill, called Chemin de la Tour des Chats. My French was enough to translate this to something of the Tower of Cats, and Jason supplied the first word as “Path”. The upper part of the path was actually the steeply sloping driveway of a couple of houses which sat perched on the edge of the hill, commanding amazing views of the river valley. This gave way to a series of steps descending the hill. I asked Jason if the large stone guard tower we could see nearby was the Tour des Chats. He said probably, but he had no idea why it was called the Tower of Cats. Exactly at that moment, a cat appeared prominently on the path right in front of us. We all saw it and burst out laughing. When we reached the tower, we walked through a portal in its base. Jason tried a wooden door that gave access to the interior of the tower, saying we could go inside, but alas the door was locked. He said that was unusual, but perhaps it was closed for the public holiday. We reached the old town at the bottom of the river, which extended on both banks. Here the buildings were medieval in age and the streets lined with cobblestones. It was ridiculously pretty. 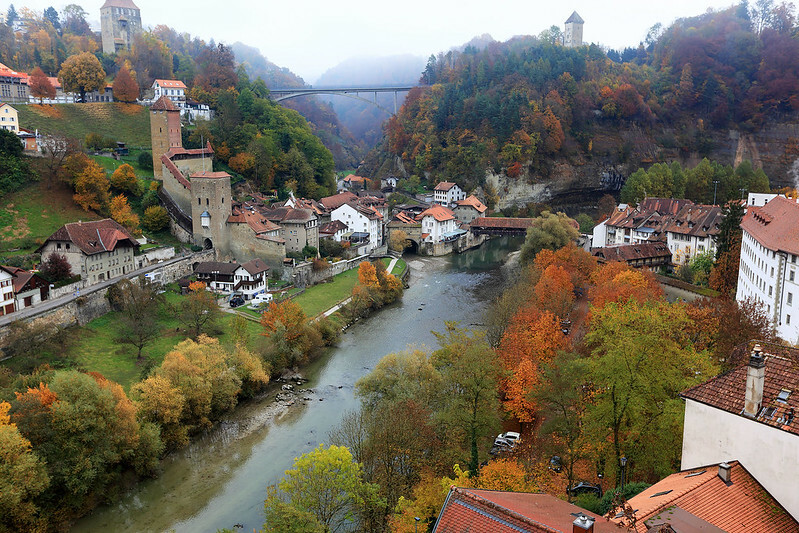 The street led to the Bern Bridge, a covered wooden bridge, which in summer would presumably have had flower pots filled with colour decorating the sides, but with winter approaching it was bare. We also noticed some flower beds nearby, covered with some sort of conifer branches with green needles. Jason said they did this to all the flower beds in winter, probably to protect the soil or something. The covered bridge was having some repair work done, extending to the cobblestones on either end. Over the bridge, back in the French part of Switzerland, the old town extended further, opening into a small plaza lined with more medieval buildings. Amazingly, a modern bus appeared and picked up some passengers, then turned around, presumably to haul them up the hill to the new town. 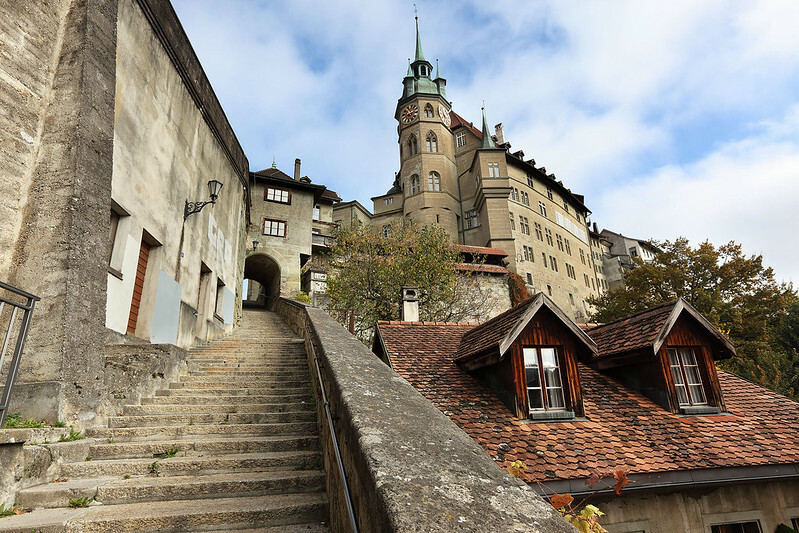 Here we passed the workshop of the old man mentioned earlier, as well as the town archives, which contained records for all the canton of Fribourg, dating back to who knows when. We crossed an ancient stone bridge, barely wide enough for the bus that had gone over it, then began climbing back up the hill to the new town above. The path sloped up gently at first, with shallow steps laid into the street. After a while this turned into serious steps, leading up with a stone wall on the left and a view over a stone railing on the right. Along the way we passed several houses, one of which surprisingly had a banana tree in its yard. I didn’t think it was warm enough here for growing bananas! The steps led us up to a plaza where the town hall (“Hotel de Ville”) sat. This had some alcoves in the bottom covered with bars, inside which we could see some small cannons. Although this was the “new town” up here, there were still many old buildings. Jason led us through some narrow streets lined with old buildings turned into shops, but almost none of them were open because of the holiday. A sign advertised (in French) a museum of machines of some sort, which was as much as my French could figure out. Interested, I asked Jason what this was, and he said it was a museum of sewing machines! Jason led us to a more modern area near the train station, and then to the University of Fribourg where he was doing his studies. This was actually rather disappointingly modern and dull, with blocky grey concrete buildings. He said the university had been there for four hundred years, but at some point they’d torn down all the old buildings and replaced them. By now we were getting hungry and decided to seek a simple lunch of sandwiches or something. We went back to the train station, where there was a supermarket, where M. bought some local chocolate to take back home for family. On the way out of the station we passed a place called Brezelkönig, which had huge pretzels and sandwiches made out of pretzels. M. got a plain pretzel, while Jason got one with cheese one it, and I chose one that had been made into a roast beef sandwich. It had some sort of mustardy mayonnaise on it, and was very good, though a bit messy to eat. We walked to a nearby grassy area to sit on a bench and finish eating. Nearby was the ugly modern high rise hotel where Jason said his mother and brother had stayed earlier this year. There was also a place called Paddy Reilly’s, which I guessed was an Irish pub. Jason confirmed this, and said it was actually the venue for the Halloween party he’d attended last night after he’d left us. The sun was out now, and it was getting a bit warm sitting out in it. We decided to head into a cafe to get a cool drink. Jason led us to the Café du Belvédère, which was a roomy place with rustic wooden walls, and a large balcony overlooking the river valley and giving a panoramic view to the west. Jason suggested trying a Rivella, a local soft drink made in Switzerland. He said it was made with milk, which sounded weird, but I tried one and it tasted sweet and fizzy like any other soft drink – you’d never guess it had any milk product in it. We enjoyed the view briefly, but sat inside out of the sun, chatting and sharing stories since we hadn’t seen each other for months. We wanted to head off on the drive to Interlaken by about 14:00, so we asked Jason to take us back to the cathedral, from where we knew the way to walk back to our hotel. At the cathedral we said goodbye for now, until he returns to Sydney in January next year. Then we walked back to our hotel, reversing our walk of the morning. This time as we passed the circus there were lots of families heading there, having parked a few blocks away, and the show was open, with music emanating from the area. At the hotel, we stopped in for a few minutes to sort ourselves out with the driving route. We also asked reception if they could phone ahead and book a dinner for us at The Verandah, a restaurant M. had found online. The lady said that The Verandah was the restaurant at one of their affiliated hotels! She made the booking for us at 18:30. 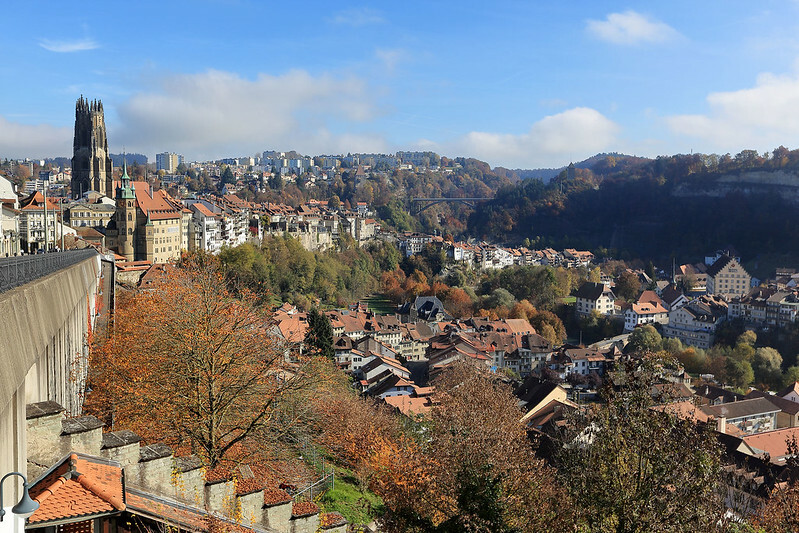 Then we left Fribourg, driving east towards Bern initially, before taking a turn towards Interlaken. We avoided the motorway most of the way, preferring to take smaller roads that would let us take our time and enjoy the scenery along the way. For the first part of this journey on the back roads, we crossed plains of dairy farming country, with some gentle rolling hills and patches of forest in autumn colour. 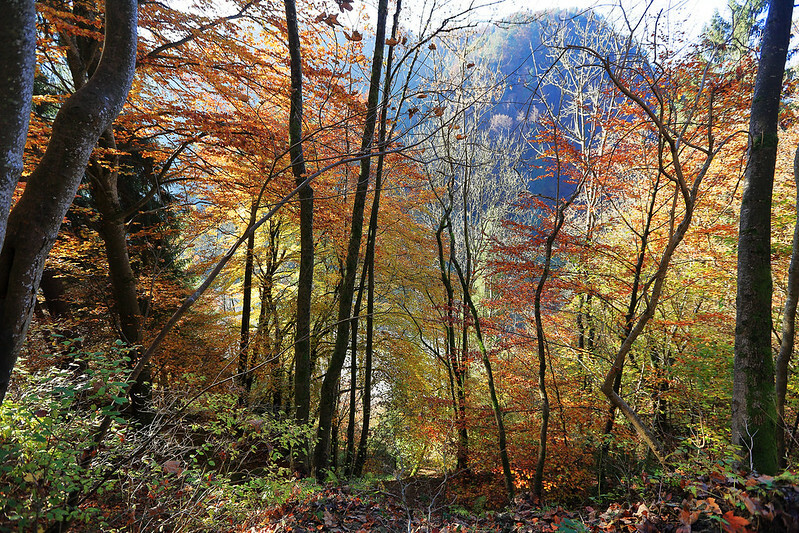 At one point we passed into the Naturpark Gantrisch, crossing a river and then climbing a steeply wooded slope that provided spectacular views. I thought we might pass through an expanse of forest, but the trees gave way at the top of the hill to more gently rolling farmland. 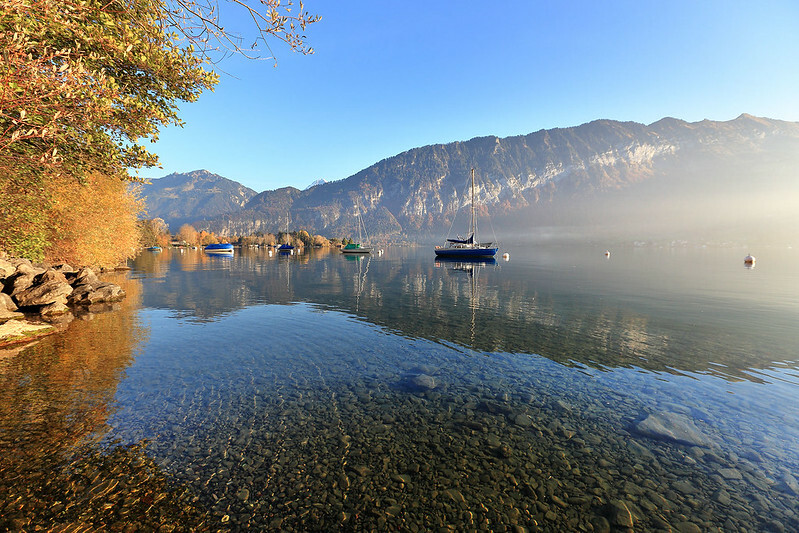 The hills slowly became mountains and we reached the Thunersee, the western lake of the pair that flank Interlaken. 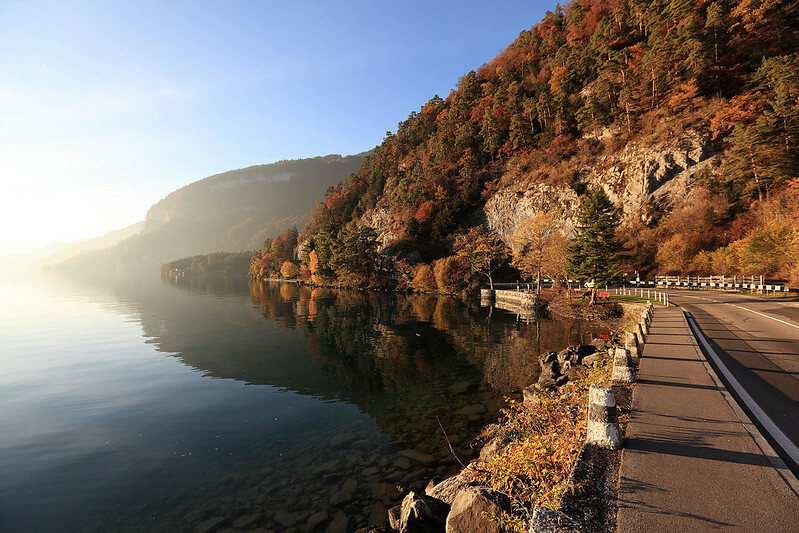 Here, in the town of Thun, we were careful to take the smaller road that wound along the northern shore of the lake, rather than the motorway that cut across the land south of the lake. This turned out to be an amazingly good decision, as the northern road ran right along the waterfront for much of the way, giving us magnificent views of the lake, the surrounding mountains, and the colourful foliage. We were also in the sun rather than the shade of the mountains, and had the opportunity to stop in several places to enjoy the views and take photos. We arrived in Interlaken around 16:30, as the sun was starting to weaken behind the mountains and the cloud. We drove into the centre of the town and found a parking spot in a car park with ticketed time charging, then walked off to find a hotel for the night. 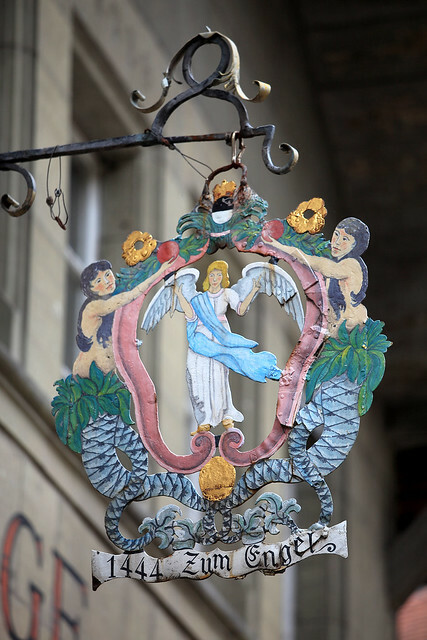 The first one we tried was the Hotel Weisses Kreuz, which looked modest but still cost quite a lot. M. wanted to check some other options, so we walked a bit further, passing some fancier hotels, getting room rates even higher than the first option. 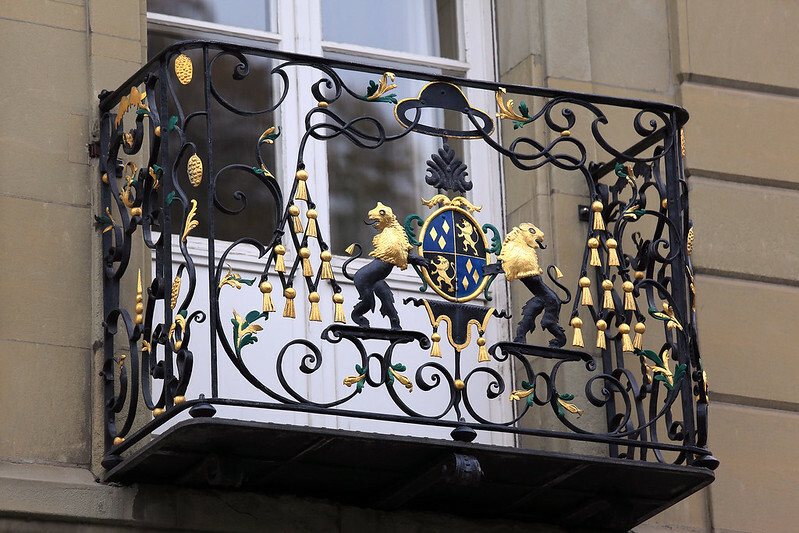 There was also the Hotel Victoria Jungfrau, which we didn’t even bother going inside without a tuxedo and an Aston Martin. One hotel we tried seemed to have no entry anywhere we could discern, except perhaps through the Swatch store on the ground floor. After exploring the store and poking our noses through several rooms, a shop assistant asked if he could help us. We said we were looking for the entrance to the hotel in the floors above, but he said that they had closed the hotel, getting out of the hotel business, and now ran the premises just as a shop. And further along we found the Hotel du Nord, but when we tried to enter, a women came out and locked the door behind her, telling us that the hotel was closed for the season! Eventually we decided to go back to the Weisses Kreuz, where we first confirmed that we could park the car somewhere. The lady sold us a CHF15 ticket which was a discounted rate for a nearby underground car park. We moved the car there and unloaded our bags, taking them two short blocks down a pedestrian mall to the hotel. After settling in, it was soon time to head out for our dinner booking. With the sun down, it was now really cold outside. Even with scarves and gloves and coats, the cold penetrated down to the skin. As we walked, we noticed lots of tourists around, virtually all of them Chinese. We reached the Hotel Royal St Georges, which is where The Verandah restaurant is, and went inside, immediately realising that this was a very expensive hotel. A waitress showed us to a table. The restaurant was almost empty, except for a woman dining alone at another table. 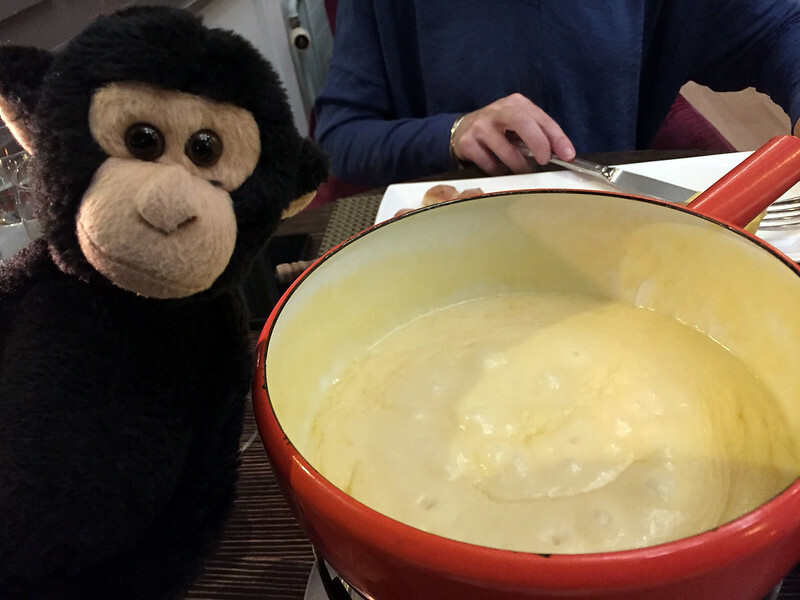 We checked the menu and saw they had cheese fondue for two, so we ordered that. For drinks, we began with a Prosecco to celebrate our anniversary, while we nibbled on the provided bread and drank the small cups of complimentary curry soup which arrived. With the fondue, we ordered glasses of wine, Chardonnay for me and a Merlot Syrah blend for M.
The fondue arrived in a large pot, placed on a burner in the middle of the table. We had long skinny skewer forks to use to dip bread into the melted cheese. The bread was a special fondue bread, baked into a shape that was a mass of little squares joined together, like a block of chocolate. With the fondue came three trays of pickles – sliced gherkins, pickled onions, and a third tray containing a mix of both of these plus other pickled vegetables – a plate of small boiled potatoes in their skins, and a platter containing five spoons with various herbs and spices: dried oregano, chilli flakes, caraway seeds, curry powder, and freshly cut slivers of garlic. The potatoes and pickles were intended to cut through the thick flavour of the cheese, by being eaten alternately with the dipped bread. It was all very good – rich and filling. We left a bit of the cheese and a little of the bread because we were too full to continue. The walk back to our hotel was very cold. We were so tired we went to bed and left showering for the morning. This entry was posted on Monday, 16 January, 2017 at 16:25	and is filed under Diary. You can follow any responses to this entry through the RSS 2.0 feed. You can skip to the end and leave a response. Pinging is currently not allowed.